What is another word for owned? having an owner; often used in combination; " state- owned railways"
government-owned, contingent-owned, canadian-owned, foreign-owned, nations-owned. property-related, Purchased, possessor, Detained, available. 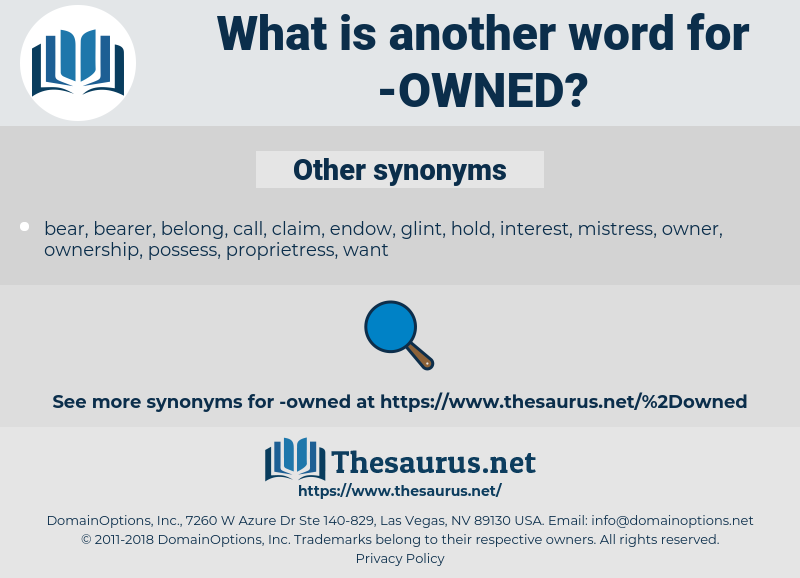 ownership, possesses, convicts, Owning, belonging, Detained, property, Properties. who, Commanded, Knew, demonstrated, Enjoyed, acquired, constituted, Belonged, Existed, Whom, Convened, monitored, celebrated, represented, won, Wished, Insisted, Superseded, Indicated, Caught, contained, deprived, Procured, retained, showed, Pertained, assumed, replaced, Which, attended, earned, Gained, handled, granted, checked, Supplied, Bought, hosted, valued, wanted, Was, Were, Came, Accounted, Looked, acquis, Displayed, Exhibited, exhibits, Took, felt, Stood, posed, fell, Carried, Amounted, Arose, featured, rested, Relied, Resulted, Went, Pried, lay, Did, Cared, thought, stemmed, Had, let, Ran, Met, kept, 'd, Meant, Got, belonging, Purchased, Detained, property. unowned, supervision, endowed, separated, owed, Participated, participation, Monopolized, Administered, conceived, Enjoyed, entitled, involvement, concentrated, governed, acquired, supervised, imprisoned, proprietor, Belonged, Overseen, extinguished, endorsed, motivated, shouldered, conducted, disconnected, dominated, Undertaken, designated, restrained, considered, stopped, identified, Inspected, society, Obtained, Explored, Exercised, allocated, monitored, accumulated, Introduced, Attributed, invested, removed, affiliated, represented, situated, regulated, absorbed, restored, Wielded, Performed, occupied, intended, established, engagement, split, charged, Enacted, Incurred, qualified, Caught, confined, contained, facilitated, maintained, deprived, obliged, oriented, obligated, Procured, verified, located, retained, addressed, Created, exploited, mastered, Housed, designed, associated, apprehended, spearheaded, Devised, Encountered, utilised, adopted, harnessed, involved, classified, registered, utilized, reserved, accrued, leveraged, derived, assumed, Channelled, Policed, Harvested, financed, Provided, stored, accused, interned, earned, learned, convicted, Gained, Defrayed, closed, handled, Denied, ruled, granted, grouped, driven, left, checked, drawn, Bought, staffed, severed, grasped, Been, Targeted, come, Subjected, realized, Sentenced, Returned, Believed, Tackled, Captured, Screened, Steered, Referred, bound, Accounted, traced, equipped, Served, align, required, Exhibited, taken, guided, paid, included, traded, founded, Logged, arrested, felt, Bribed, led, formed, tracked, locked, shared, mixed, Carried, tested, listed, covered, Aimed, headed, related, found, shut, mined, Audited, attached, Passed, \, vetted, Borne, broken, Chaired, tapped, given, Dealt, placed, funded, linked, Fished, Cared, twelve, Had, heard, run, Met, kept, cut, Gotten, Got, Purchased, Detained. Sometimes that is an advantage, even on an island owned by the white Ingles. He had never owned anything of the sort before.